The tragedy of life is not death, but what we let die inside of us while we live. - Norman Cousins. Read this quote on the first page of Robin Sharma's book - "Who Will Cry When You Die." I've read this book earlier - may be from some library or from a friend's collection and since then I had planned to purchase the book. Ordered it from Amazon India, as it was available for a huge discount and received it today. It's a book that can be read by anyone, anywhere and anytime and one can always find something good to read. For example, the first chapter of the book asks us to "Discover Our Calling". With the constant advances in the field of science and technology, we can easily call a friend overseas but we forget to talk with ourselves. We forget what is the purpose of our life and wander ourselves the way life makes us act. A quote from the book: ".... if you don't act on life, life has a habit of acting on you." 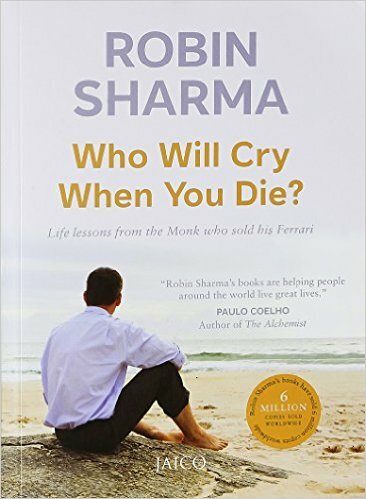 In short, a great book that teaches the art of living.